Dubai, United Arab Emirates; 5 November 2018 – Turkish Airlines welcomes a new era of Turkish Aviation with the opening of Istanbul New Airport. The world’s largest international hub will be home to Turkey’s national flag carrier and establishes Istanbul’s place as the centre of the globe for aviation and travel. The smart airport, thanks to its strategic location at the crossroads of east and west, has great potential for Turkish Airlines and the global aviation industry and will welcome 200 million passengers per year upon final completion. 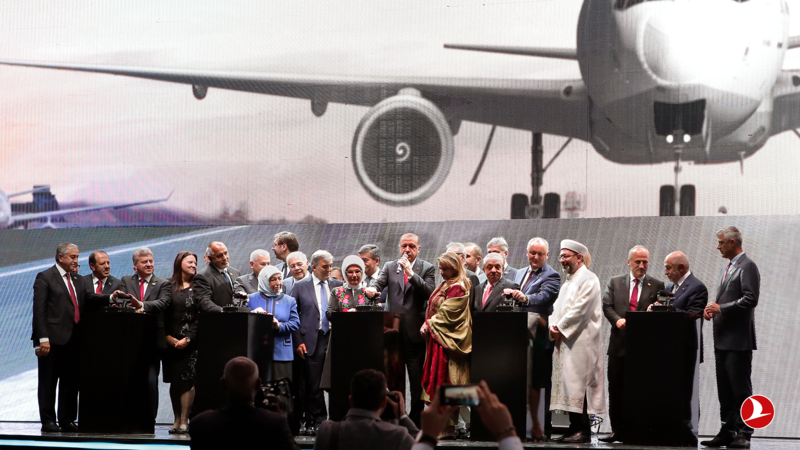 To coincide with the 95th anniversary of the founding of the Republic of Turkey, the eagerly-awaited Istanbul New Airport was named “Istanbul Airport” at the opening ceremony yesterday, officially opened by President of the Republic of Turkey, Recep Tayyip Erdoğan. Passengers on the first Turkish Airlines flights to the new airport that specially operated yesterday for the opening ceremony, received souvenir tickets. The opening of the new aviation hub, combined with the dynamism and energy of Turkish Airlines, will usher in a new era for the carrier. Following the official opening of Istanbul Airport on 29th October 2018, Turkish Airlines is operating a limited number of domestic and international routes from the new airport, while all operations and existing flight schedule will run as usual from Istanbul Atatürk Airport. New, additional flights will be operated from Istanbul New Airport to Ankara, Antalya, Izmir, Azerbaijan (Baku) and TRNC (Ercan) until 30th December. Pursuant to existing planning, on 31st December, all operations will move from Istanbul Atatürk Airport, after which, all flights will operate from Istanbul New Airport. As the airline that flies to more countries than any other, Turkish Airlines will be able to increase its network extension capacity and opportunities for new routes and timings with more slots available, allowing growth for both passenger and cargo transportation. Passengers will benefit from a redefined travel experience throughout a superbly laid out ‘built from scratch’ terminal using the latest technologies and innovations. The megaproject will be launched in four phases with the final phase set to be complete in 2028. In all, the complex will occupy an area of 76.5 km2, boasting six runways, four terminals and 233 aircraft parking positions, with the capacity to serve up to 200 million passengers a year with 500+ check in desks and 225,000 employees. Upon completion of the final phase, the largest international flight hub will incorporate offices, residences, hotels, a health center, culture and art buildings, a shopping mall, designer outlets, an EXPO convention centre, and meeting and training facilities on site.